my homepage is covered with turkeys right now! between the cinnamon roll/bacon turkeys that we’ll be making for breakfast on thanksgiving morning, the chocolate peanut butter cup + pretzel candy turkeys (which will undoubtedly be gone long before we even get close to dinner), and of course the pinecone turkey crafts we’ve shared, including the felt-feathered pinecone turkeys and the silk-feather pinecone turkeys…i mean, we are turkey-ed out! i’ve got just one more pinecone turkey to share with you today! pinecones. if you’ve got pine trees growing near your house, first of all – you’re lucky! your pinecones are free! secondly, you will undoubtedly have a lot to choose from, so choose the biggest and best for this craft. if you’re like me and have zero access to pinecones falling off the tree, you’re going to have to buy them, so look for big, beautiful, unbroken pinecones. you can find them at craft stores in mesh bags…usually scented, which is just an added bonus! paint. my favorite colors to use for anything fall-related are deep orange, red, yellow, and brown. 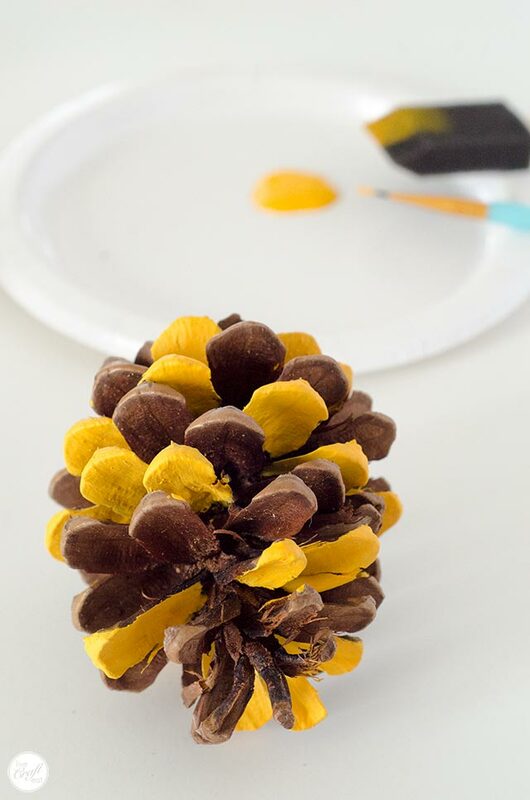 since the pinecones are naturally brown you won’t need any of that paint color, but you should pick up some paint in the other fall colors you like. paint brushes (aff link). 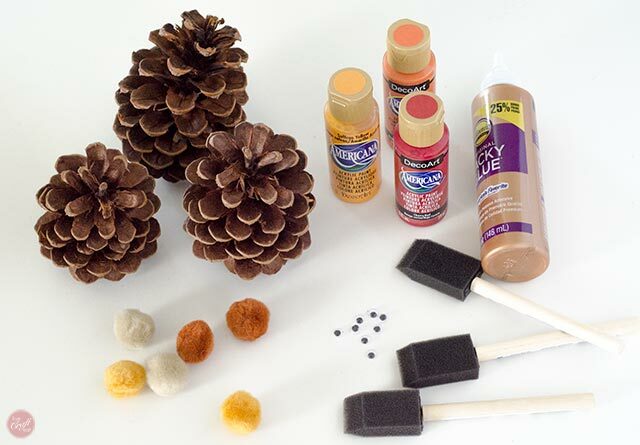 i started with the little foam brushes pictured below, but truth be told: i didn’t like them. they’re great for other projects, don’t get me wrong! but for this one, it is definitely better to go with a smaller paintbrush. 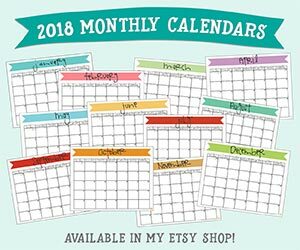 pom poms (aff link). 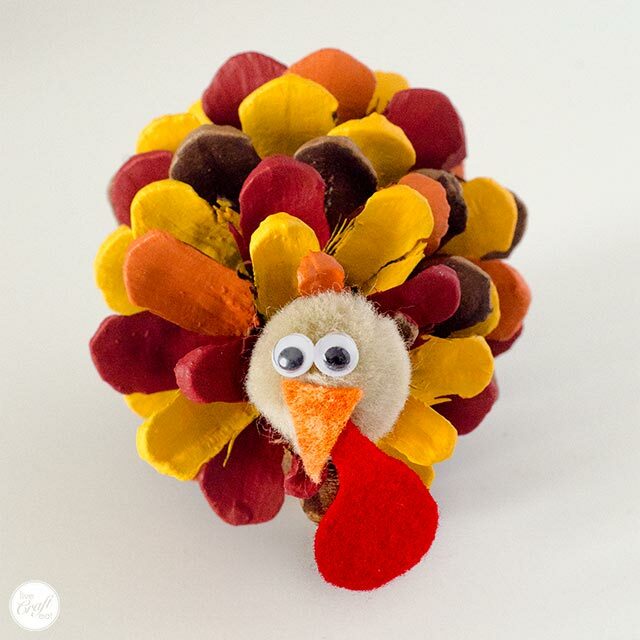 you’ll need little – medium size pom poms for the turkey’s face. googly eyes (aff link). and you’ll need to have some of these to make him look extra cute. scraps of felt. in both orange and red – orange for the beak, and red for the waddle. glue (aff link). just a little bit of white glue is needed to assemble the turkey’s face and then adhere it to the pinecone. …and then finished off with orange paint. i left some of the scales natural because i thought their brown color looked so great with the red, yellow, and orange colors. when you’re painting the scales you want to make sure you are spreading each color around and not bunching all the reds in one area, etc. you need to try to disperse each color throughout. also, you will probably find that you need to do 2 coats of paint. after you do the first coat for each color you should then be able to do the second coat almost right away – the paint dries relatively quickly. 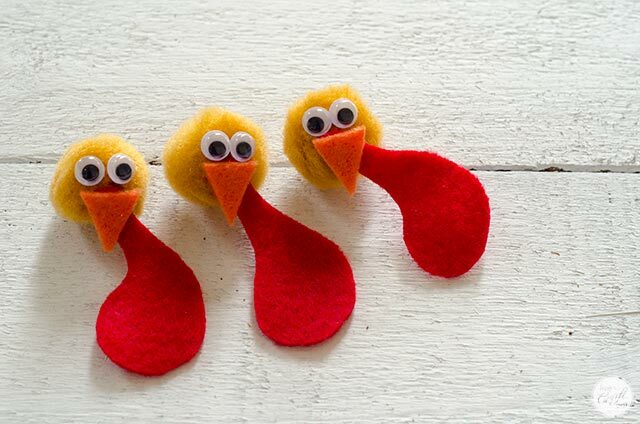 now you need to make the turkey faces by gluing on two googly eyes. next, you’ll need to cut out a small triangle from your orange felt, and a waddle from your red felt. i just freehanded the waddle – a rounded shape at the bottom with a thinner pointed shape at the top. 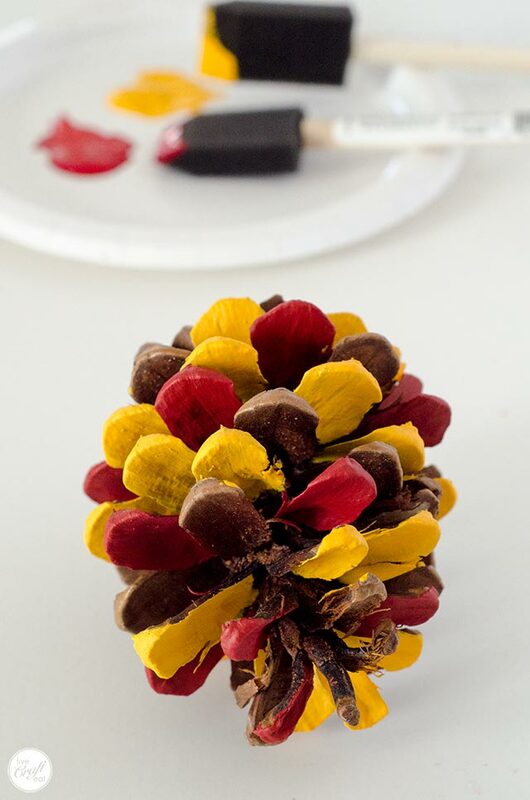 there is a piece of pinecone that sticks out of the very top/front of the pinecone and you’ll need to carefully cut that off, and potentially a few scales as well, in order to nestle the turkey face at the front of the pinecone. 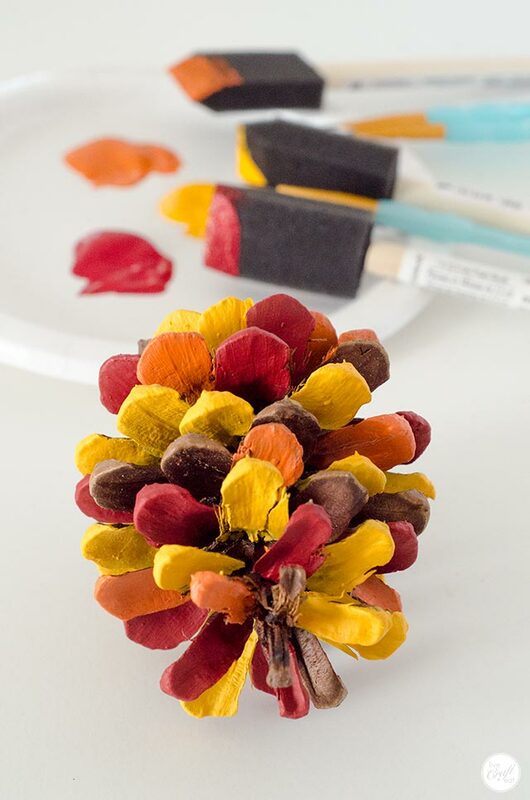 add some glue to the back of the pom pom and hold it in place until it dries. oh, just look how adorable he is!! he is going to look so great on our thanksgiving table! i think being a place card holder would be the perfect job for him! 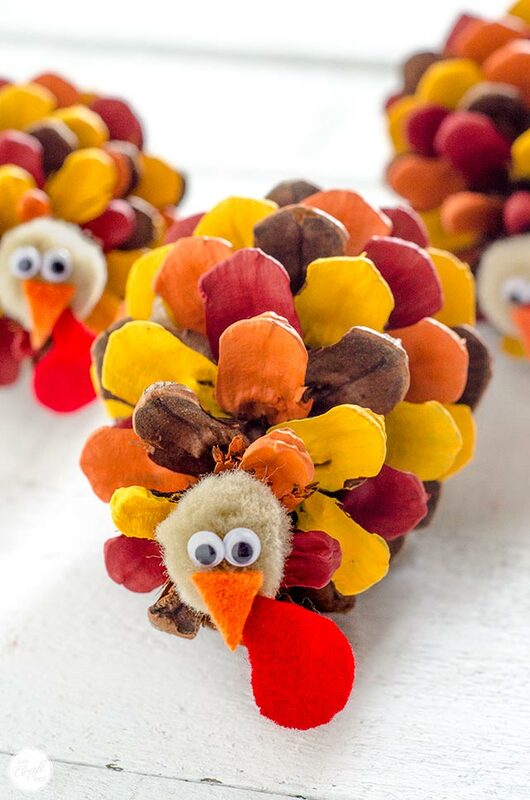 i hope you enjoy the third installment of our three thanksgiving pinecone turkey crafts! they’ve all been so fun, and my kids just love them!